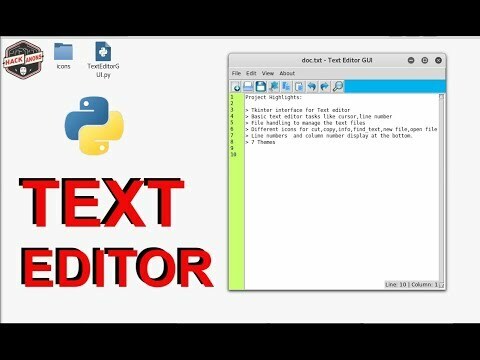 Text Editor GUI using Python Text editor is an application like notepad to write documents and other files.The text editor is made using python using Tkinter GUI interface. ● Line numbers and column number display at the bottom. The application is built using python library Tkinter. For creating graphic user interface (GUI) on Python we need to use Tkinter library. We are also having different packages and approaches for creating GUI like QT for Software Development and Django, Flask for Web app development. Here we choose Tkinter because it provides a very quick and easy way to create basic GUI applications. Enter event loop to trigger action against every specified event. To open and save files , the project is using Python file handling system and its basic method.The text editor offers functionalities like open,close ,edit and create new files using Python. The user interface is developed using tkinter components. ● Make a simple GUI through Python tkinter interface. ● Add a input box for the text editor files. ● Add file handling functionalities for the text files that you create like open,close,edit a existing file and create a new file. ● Add icons or menus for this file handling options. PROGRAM_NAME = "Text Editor GUI"
Library uses some icons get them from here, need to install pip so that we can install tkinter library. So, that it we are done with our First Python3 core project i.e. Guit Text Editor using Tkinter, File Handling.